The other days we finished the review of WinX HD Video Converter Deluxe from Digiarty and as a part of the review, we are giving away 10 license codes for this program. If you leave a comment in the review of this all-in-one HD/4K video converter, you will have a chance to get a free copy. This app is designed to convert any HD and Ultra HD (4K) videos for playback with smartphones and tablets, such as Apple iPhone, iPad, Microsoft Surface, Sony PSP, Xperia, WP8, HTC One M8, Android, etc. and this article will walk you through how to download and convert HD and 4K videos with WinX HD Video Converter Deluxe. Installing is a breeze and you just go over to download WinX HD Video Converter Deluxe that is available for a variety of Windows (XP, Vista, 7, 8.1, Windows 10) machines. It has Mac version namely WinX HD Video Converter for Mac, a Mac HD video converter that can convert high-definition videos such as MKV, M2TS as well as convert 4K UHD videos on Mac OS X. After the setup is done, click on the software to start it up on Windows or Mac. As previously reviewed, WinX HD Video Converter Deluxe is a HD/4K video converter, and better still, it works as a downloader allowing you to download videos and music from just about any video site, including YouTube, Yahoo, Facebook, Vimeo, Dailymotion, MTV, Metacafe, Vine, Break etc. With WinX 4K video converter, you can easily download SD/720P HD/1080P HD/4K UHD online videos ahead of conversion. No third-party software required, you just click “YouTube” –> “Paste & Analyze” the URL of a YouTube video –> click “OK” to begin downloading videos like the next picture. Download SD/720P HD/1080P HD/4K UHD Online Videos from more than 300 online videos sites, including YouTube, Yahoo, Facebook, Vimeo, Dailymotion, MTV, Metacafe, Vine, Break etc. Downloading content is done in a matter of minutes and now you can watch them from hard drive. If you prefer, you can convert downloaded HD/4K videos to mobile or tablet friendly formats such as MP4 or H.264. With built-in 370 video audio codecs and 410+ presets device profiles, so to speak, WinX HD Video Converter Deluxe can convert almost everything from your media library. But if you want to rip protected DVDs for playing on iPhone 6S/6 Plus, iPad Pro/mini 4, Nexus 7, Apple TV, HTC One M8, Samsung Galaxy Note 5/S6 edge+ and so on, you are encouraged to download WinX DVD Ripper Platinum. WinX DVD Ripper Platinum is the No.1 fast DVD ripper that can flawlessly rip any DVD to mainstream videos such as rip DVD to MP4, H.264, AVI, MPEG, WMV, MOV, FLV, etc for playback on latest smart devices like iPhone 6/6 Plus, iPad Air 2/Mini 3, Samsung Galaxy Note 4/S5, Kindle Fire etc. 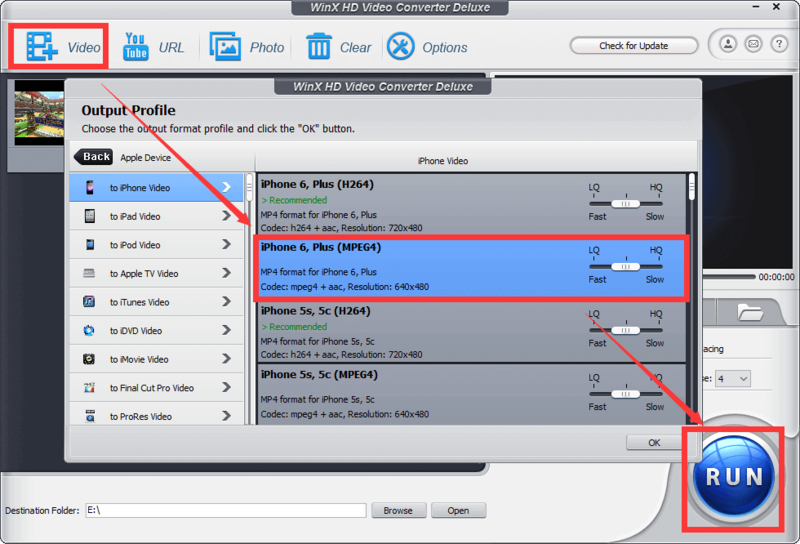 Click on “RUN” button to convert HD videos to iPhone 6 Plus.